Happy Birthday to me! That is all. Grateful for: friends, family, my health, my job, my readers and a very good life overflowing with more comforts than I need. P.S. 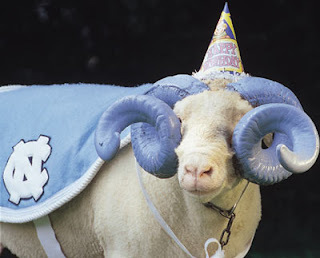 Every year, the alumni association at UNC sends me a birthday card and it never fails to crack me up. I thought I'd share this year. Enjoy! Here's to a great year for you! Happy birthday. Happy Birthday! Hope the snow does not keep you from enjoying your day. Dude! That's reason enough to join the GAA. A Ramses birthday card - awesome. Happy birthday - hope you had a good one! Happy birthday! I hope it is a super one. I just want to take this opportunity to thank you for your blog, and for keeping it positive. Reading your blog reminds me to be grateful for the many things I do have, and to focus not so much on the few things I don't. Thanks for the birthday wishes! It means so much to hear from you. And, Kim, I'm trying hard to stay focused on the positive. We can do it! Plus, Ramses is the BOMB.